A neat sawmill shed was the first project when the family invested in a portable sawmill with log house molder. “Here we can produce timber all winter, “says Donald Oberg. “The building was an education for future construction projects, “says Donald Oberg. The family lives in Sweden and Donald went to carpentry course at Logosol three years ago. The following year his children Matthew and Sandra also joined the course. 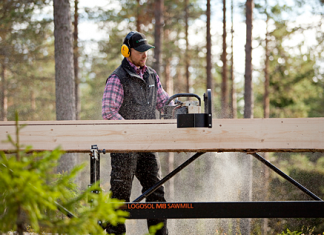 After that the family bought a Logosol M7 sawmill. 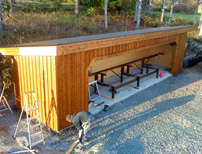 Their first building project was an isolated shed for the sawmill. Now they are building a timber cottage for the summer, and in the future Donald would like to start a family business. The product? Log cabins!